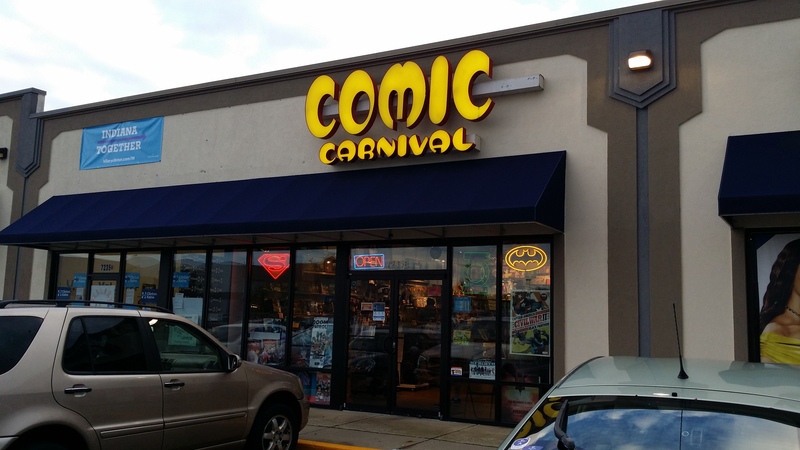 Any Geek growing up in the Indianapolis area should remember at least one of the Comic Carnival locations. They’ve been around as long as I can remember, giving me that next step up from the comic book rack at Hook’s Drugs. Growing from comic books into a sci-fi fan, they were a great place for a young Trekkie to go to find little collectibles and toys to feed his fandom. As I got older, with disposable income (ah, the nineties! ), the higher end collectibles catch the eye, as well as being a good place to hit for a quick pack of Magic cards or to replace a 20-sider that you were convinced had it in for you. 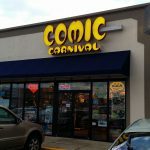 Every time I walk into the Comic Carnival location on the North Side off Keystone, I’m just reminded of the amount of time I’ve spent in their stores. I’m still upset that while I passed it often, I never visited their old Broad Ripple location, but their location on Keystone works very well. A few months ago, they moved from their old location beside Dollar Tree, to the other end of the strip, closer to WalMart, with a more spacious location. The North Keystone location had always looked like a stereotypical comic shop, with piles of long boxes and a very crowded atmosphere, because they had more product than their shop could handle. Their new location does not have that feel, at all. They are updated, well lit, spread out, and still have a terrific selection of both new release books, as well as back issues. In addition, they have a small selection of board games, a lot of Munchkin games, action figures, statues, collectibles, bottle openers in the shape of the Batmobile… pretty much anything a well respecting Geek would like in their Geek Cave. The games they host, instead of stretching down the middle of the store, is now in a separate room in the back, as well, so you aren’t going to feel like you’re crawling over someone as you’re looking for books. Not only do they have a good selection of Geeky items, they also are friendly. Every time I’ve walked in lately, I’ve been greeted by happy employees who wanted to know what I was looking for, or if I just wanted to talk comics. I haven’t seen anyone ignored, and I haven’t heard any negativity being spouted by anyone as I’m going in. It’s become a really friendly atmosphere. What are they? A friendly local comic shop, selling back issues, current issues, offering pull list services, plus selling games, toys, and collectibles. When are they open? They’re open Monday through Friday, 11:00 AM to 8:00 PM, Saturday from 10:00 AM to 8:00 PM, and Sunday from 12:00 PM to 5:00 PM. Just kidding on the phone number! Internet! Where are they online? Of course, they have a website, but you can also follow them on Twitter and Facebook, look them up on Pinterest, and leave reviews on their Yelp page. If you stop in on Saturday, look for Mike, and tell him Tony sent you. It probably won’t get you anything, but he might get a kick outta it! Mike definitely WILL get a kick out of it. We should get you some buttons or something…so I could give them out to anybody who does this. Buttons are on the list. Man, I grew up in the Broad Ripple store. And, you hit me with the growing up from Hook’s drugs as that was my path, too. The Broad Ripple store was such a part of the old neighborhood there. There was a Ed Shrock’s toy store down the street for a while and it backed to the Vogue’s parking lot which was a notorious skater hang out at the time. I still remember Mike and Stuart who worked there. My interest in toys and collectibles today is almost solely a result of having such a resource so close that I could ride my bike to it every day they were open.